The first episode of 2014 is a look back to some of the topics I covered in 2013, and for what I hope is a good reason. With a podcast, unlike a piece of writing or an image, it is very hard to decide quickly whether this is something I want to pursue further. Of course some things are an instant turn-off: really bad audio quality will usually send me packing, as will a pile of unedited ramblings no matter how good the audio quality. Aside from that, though, it takes time to listen to a podcast and decide whether I want to hear more. 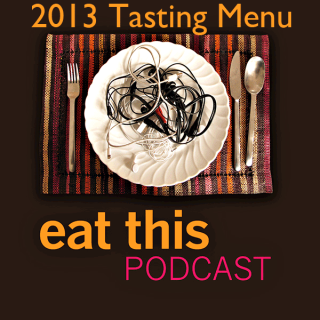 With that in mind, I put together this tasting menu from 2013, to give new listeners an idea of what Eat This Podcast is about. So, what is it about? I’m not exactly sure. Looking at the world through a food lens, I sometimes say. As I was putting this selection together, though, some other themes emerged. I’m not really ready to share those in detail, but they might colour my selection of topics in the future. I should add, too, that I welcome any and all suggestions. If you’ve been listening since episode 1, you have my permission to ignore this one. Or you could share it with someone who isn’t yet a listener. That would be good. And here’s to 2014.